Bogor, 16 February 2016. 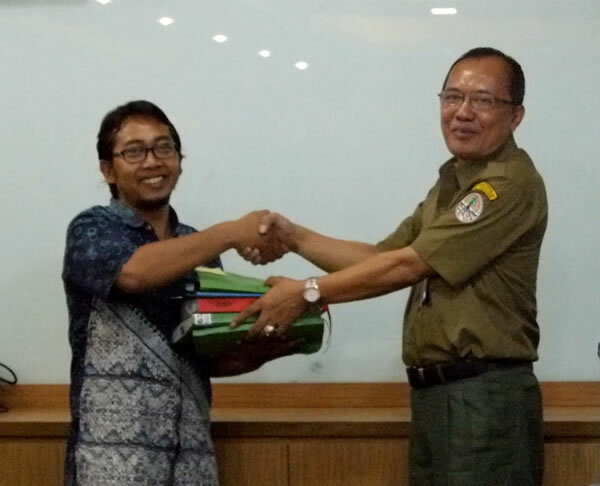 The 3 year-long process to push forward the freedom of information in forestry sector has eventually come to a turning point, which was marked with the handover of forest management document from the Ministry of Environment & Forestry (MEF) to FWI on Monday, 15 February 2016, at Manggala Wanabakti Building, Ministry of Environment and Forestry. Freedom of information in forest management is eventually endorsed by the MEF. The Secretary of Directorate General of Sustainable Production Forest Management (PHPL), Sakti Hadengganan Harahap, in a symbolic ceremony, handed over the RKUPHHK, RKTUPHHK, RPPBI, and IPK documents to the Deputy Director of FWI, Soelthon Gussetya Nanggara. The government, including we, the MEF, are highly concerned with public freedom of information. So if it is truly considered as a public document, we will surely share it with the public. Of course we hope that the public together with government can obtain the same information. Public can also pay more attention to ensure the development process go well,” stated Novrizal, the Head of PR Bureau, MEF, during the document handover ceremony (15/02/16). Linda explained that transparency is one of the key indicators in forest governance assessment. Thus, disclosre of critical information is a prerequisite to be met to achieve good forest governance. The information disclosure that is currently being implemented by the MEF is a further step toward the improvement of forest governance. MEF has now started to apply the principles of transparency and freedom of information in carrying out its duties. An open public document might increase public participation, both those who reside near as well as far from the forest, to participate in managing and oversee the forest. “This is a triumph for everyone who is concerned with the condition of Indonesian forests. At this moment, we need to bear in mind that the MEF has been committed to be more open. We definitely fully support and appreciate that step, and we will keep safeguarding the implementation of freedom of information in forestry sector,” said the Deputy Director of FWI, Soelthon Nanggara, during the press release. Forest Watch Indonesia (FWI) is a network of independent forest observers consisting of individuals sharing comitment to establish an open forestry data and information management process in Indonesia which can guarantee a just and sustainable forest resources management. FWI was appointed as National Secretariat of JPIK at the declaration of JPIK establishment meeting in 2010. RKUPHHK (Rencana Kerja Usaha Pemanfaatan Hasil Hutan Kayu/Business Work Plan for Forest Timber Use) is a work plan for the whole work area of Izin Usaha Pemanfaatan Hasil Hutan Kayu (IUPHHK/Business Permit for Forest Timber Use) for 10 (ten) years, which includes, among others, forest sustainability, business sustainability, and balance between environment and local community social economic development. (Minister of Forestry Regulation Number P.56/Menhut-II/2009 jo.P. 24/Menhut-II/2011; Minister of Forestry Regulation Number P.62/Menhut-II/2009 jo. P. 24/Menhut-II/2011; Minister of Forestry Regulation Number P.62/Menhut-II/2008 jo. P.14/Menhut-II/2009).